Glass bulbs? Babyproofing no no. Baby's actual toys? Score one awesome idea brought to you by twin ingenuity. Most of them already come equipped with a handy dandy attachment piece- usually used for tagging on infant carriers. Perfect for hanging on branches within arms reach. 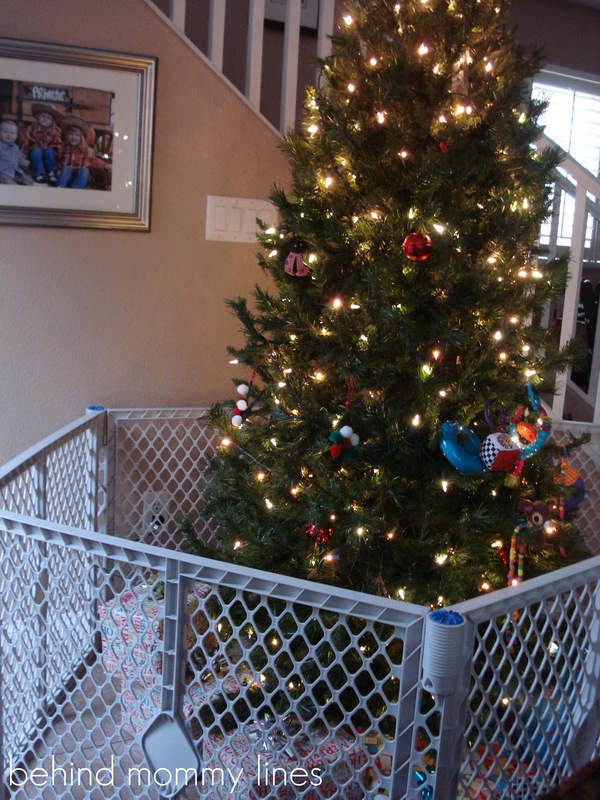 Isn't the grey kidpen just a delightful dose of holiday cheer? Yes, I think so too. Really classes up the hastily lit and scantily decorated tree. 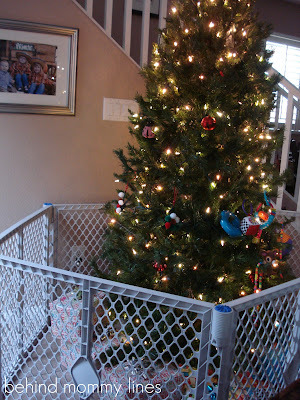 I was dreaming of the year when I could put up a tree without a gated perimeter. It was then I realized the barrier served more than one purpose. Sure, it kept Little Man and his tiny prying hands away. But it also kept the presents a good distance from the dog who likes to pee on everything. So I may be stuck with the pen. Around my tree. No matter how gorgeously I may decorate it. The beauty will always be marred by the faux chain link. Awesome. 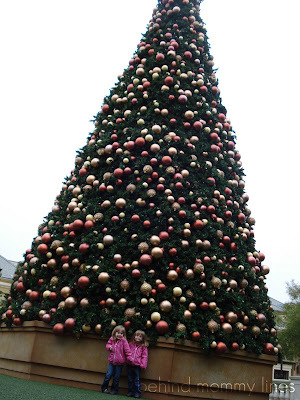 And speaking of trees; here's a real TREE! Ornaments the size of your head. That's the way to go!